Hanging mistletoe at Christmas is a tradition for many American families. At Christmastime if you’re caught under the mistletoe, which is usually trimmed with evergreens, ribbons, and other ornaments, you cannot refuse a kiss. Legend has it that the plant has the ability to give enhanced fertility to the smoochers below it, as well as being considered a ‘plant of peace’ which would squelch even the most hostile disputes. In this post we’re going to talk about some very surprising mistletoe facts. Mistletoe is a parasite that attaches itself to evergreens, plants, shrubs, and bushed, taking their nutrients and water. Obviously, this will hurt and weaken the host plant and eventually kill it. The pest grows exponentially will take down much larger plants in a small amount of time. Once a tree is a host for mistletoe, it’s very difficult to remove. The seeds sprout and grow through the bark of trees right into the tissues – up and down the branches. Simply cutting off the part of the mistletoe you can see is not enough. The only way to effectively fight back is to remove the compromised limb or branch entirely. Eating mistletoe is not a good idea. Ingestion can cause blurred vision, sleepiness, diarrhea, nausea, and even seizures. Phoratoxin, the poisonous element of the plants, is most concentrated in the leaves, but can also be found in the berries. The mistletoe we’re used to is not the only variety out there. 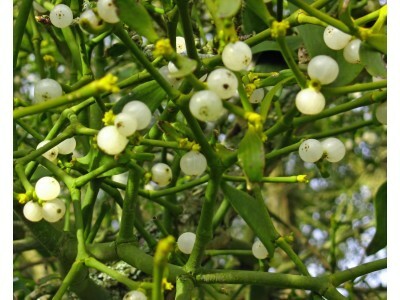 Some mistletoe has green stems with oval leaves and small, white berries. Dwarf mistletoes even have yellow or orange leaves while other varieties have no leaves at all. At Premium Christmas Wreaths in Southwest Michigan, we know a thing or two about Christmas traditions. The products we offer range from very traditional to completely unique. It’s never too early to start thinking about the holiday season – whether it’s wreaths or other arrangements for corporate Christmas gifts or decorations for your own home or office, we have what you need!